Not only am I excited, but I'm surprised for this loss, too. Yesterday consisted of eating out at Texas Roadhouse and Menchies, the best frozen yogurt place I have ever been to! 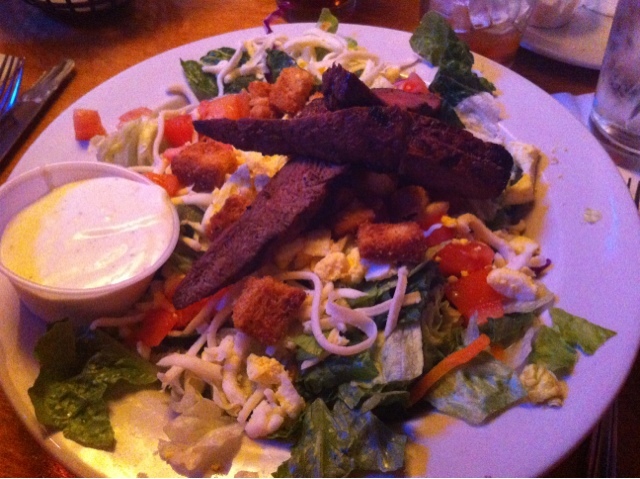 Before we went to Menchies, my husband and I took my mom and step dad out for dinner at the Texas Roadhouse. My mom feeds us so often, so it was nice to take them out for a change. Before my mom left the restaurant, she actually told us that she was making meatball subs and pasta salad tomorrow (today) for lunch, and said we had to come over. See what I mean? She loves to feed us and we aren't complaining! Being that my mom lives a couple blocks away from us, it's not unusual for me to give her a call on my way home from work to see what she is making for dinner. I often have the choice of either sticking with my dinner plan or going over to have my alternative dinner plan at my moms house. Actually, my mother-in-law lives a little over a mile away from us, too, and she often tells us what she is making for lunch/dinner. Moms are just great like that! We shall never go hungry living between two moms. After dinner at Texas Roadhouse, my husband and I spent a good four hours shopping at the mall. I got two new pairs of work pants and one new pair of jeans. Going shopping for pants has never really been a fun task for me. Pants are either too long or too small for my shape. For a majority of the shopping trip yesterday, the pants I tried on were too big and long. Pants being too big is unusual for me, I was trying on my size (24) and they were all too big. It was finally at the last store when I decided I would take in three different sizes of pants to try on. I found a style of work pants that I liked and picked out a 24, 22 and 20. I first tried on the 24; too big. I then tried on the 22, doubting they would fit. I zipped them up and they were actually very loose in the legs. I set them in the maybe pile and decided to try on the size 20, just to see how much more work I had to do before fitting in to this size. I haven't been able to fit in to a size 20 pant for at least 4 years, so I was very doubtful that I would be able to pull them up over my waist. When I zipped up the size 20, I was stunned. They fit perfectly! I think that I spent about 2 entire minutes in those pants, just looking at them in the mirror, speechless. When I took them off, I double checked the tag, just to be sure. It was a size 20, alright! 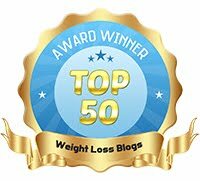 I have dropped TWO pant sizes! I don't even know when this officially occurred because I despise shopping for pants. It has been quite a while since I have done so, at least two years since I have had any luck finding pants that I have liked and that fit right. Yesterday's shopping trip, however, was a complete success! After our shopping trip, we went to Menchies. I don't know what took me so long to try fro yo (frozen yogurt) but I am officially hooked! I don't ever want ice cream again. (Don't quote me on that last sentence.) Frozen yogurt is just so creamy and light. It's truly amazing. The shop was really fun, too! 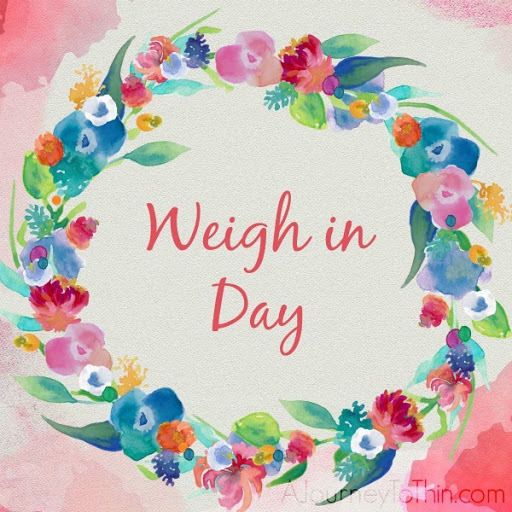 You pick your bowl, pick your flavor of fro yo, add whatever toppings your heart desires, weigh then pay! It's $.45/ounce, and worth every penny! After we got home, I was thinking of excuses to stop there again. I think that Menchies is going to be included in many date nights to come! I'm trying to think of an excuse to go back today. Vanilla yogurt, white chocolate chips, fresh raspberries, fresh strawberries, yogurt covered pretzels, and animal crackers. 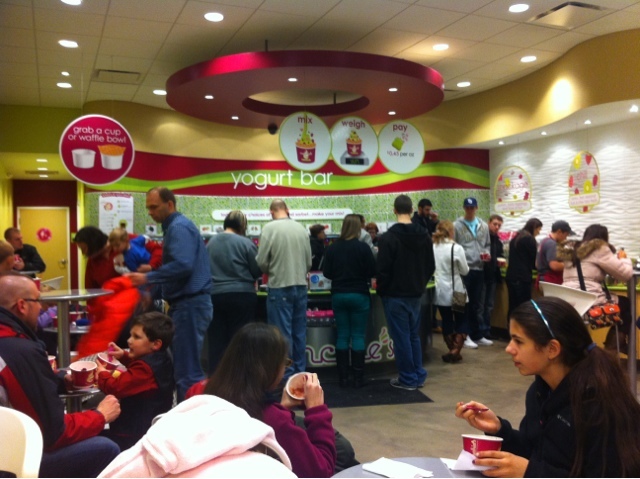 Have you ever tried fro yo, before? Do you prefer ice cream or fro yo? 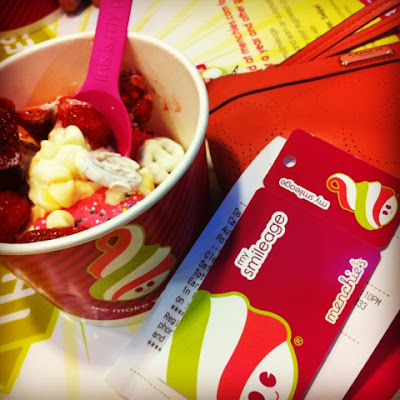 What are you favorite toppings for your fro yo? Congrats on the weight loss! Wohoo for being at your lowest thus far! That is AWE-SOME! We have fro-yo here where I live and only a different franchise on every corner. I have never been to Menchies (although we have one). My favorite is Y0-Factory which uses Yo-cream for their fro-yo. They have the richest creamiest of all frozen yogurts I have tried. Toppings? 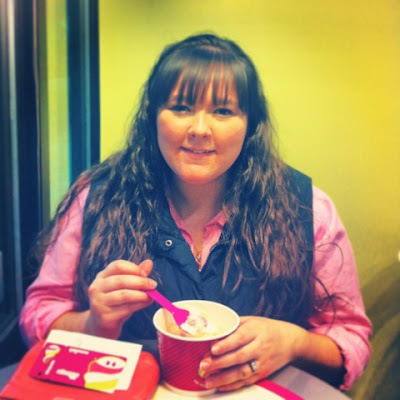 I love cake batter fro yo with strawberries, it tastes like strawberry short cake. 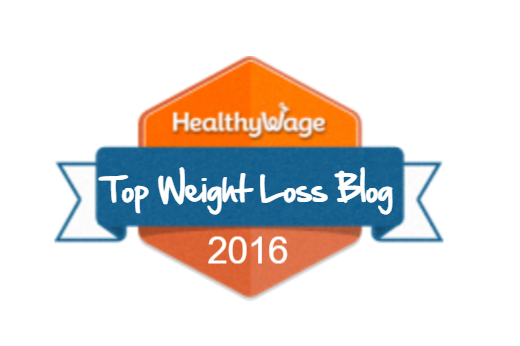 Congras again on the weight loss. You inspire me to keep moving forward! That's fantastic! Isn't it amazing that we don't even think to say the pants might be too big? ?